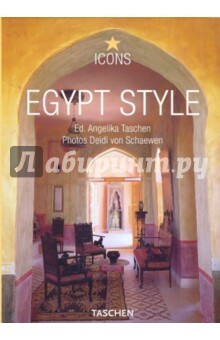 Ancient culture meets modern style in this wide-ranging selection of interiors throughout the magical land of Egypt. From an apartment in Cairo to a house at the foot of the pyramids, a casbah on the banks of the Nile, and an Arabian palace, the homes featured within offer us the chance to explore Egypt`s most unique interiors. About the editor: Angelika Taschen studied art history and German literature in Heidelberg, gaining her doctorate in 1986. Working for TASCHEN since 1987, she has published numerous titles on architecture, photography, design, contemporary art, interiors, and travel. About the photographer: Deidi von Schaewen, who has lived in Paris for thirty years, is a contributor to a range of international periodicals and a filmmaker, and has published numerous books. Her publications with TASCHEN include Indian Interiors, Fantasy Worlds, Gardens of Provence, and Inside Africa. Издание на английском, французском и немецком языках.